It's 6:00 a.m. but it's already starting to warm up in California's high desert. A big man, with powerful arms and shoulders, is up and about on his ranch property on the fringe of the Lucerne Valley. There's work to be done. After all, life doesn't often wait for a man who prefers to spend his winters holed up inside somewhere or minds his summers sitting sweatless, sipping lemonade in front of a noisy fan. No sir, if ya thing that, life's sure to pass you by. Pat Casey found out as much years ago. Born into the lower middle class life in the bowls of southwest L.A., Pat hardly knew his dad; but his mom, now that was a different story altogether. Mrs. Casey was the stubborn kind, something right out of an old Irish working class tale, she was. Befittingly, she took to raising young Patrick right, straight and narrow, stressing those good Irish virtues of forthrightness, honesty, and love for purposeful labor. Oh, did young Pat love labor. For the last 45 years he has kept his Irish eyes open and remembered those pearls of wisdom from his mother, who was as much a saint to him as Nixon's mother was to the former President. Growing up in the hype of a turbulent neighborhood where Tina Turner's description of 'rough' was certainly apropos, Pat found out that success was determined less by who you ran with and more by your long term vision. Our young, impressionable Patrick turned out no different than dozens of others who overcompensate in the face of hoodlum mania. As long ago as age 12, Pat remembers the terrifying local toughs, the bullies who always seemed regularly beaten about by their fathers, if they had one at all. Yeah, the guys with the chips on their shoulders larger than the solidified remains of the biggest baddest cow in the stockyard. You know the ones, the James Dean types. Somehow our boy persevered and pulled through with his ego intact. In fact, at George Washington High School, Pat did all the things normal boys did, especially dreaming of being a pro football star. At 14, the would-be Bronco Nagurski took to the weights, just like any other pukey 135-lb freshman. At that juncture, the similarities ended, because while the other guys merely used the barbells, Casey became seduced and enthralled by the sound and smell of the cold steel, by the invigorating power the iron produced. As a thirsty mosquito stalking someone's sweat on a steamy evening, Pat took to the barbells, and when it came to the bench press . . . well, that was a special sort of attraction! Yes, brothers and sisters, you can talk and talk all you want, but when it comes to heaving prodigious benches, there is but one king. One man stands alone as the greatest pioneer of supinely pushed weight. Pat Casey was the man, is the man, and forever will be the man, when it comes to bench pressing. In those early formative days, Pat come into George Redpath's Gym at least as frequently as the tide comes in. Pat stumbled upon some early gems of training, authored by Canadian powerhouse Doug Hepburn and eclectic Marvin Eder, a paragon of strength who justifiably lays claim to being the greatest prodigy of power who ever breathed Earth's free air. Training his benches for heavy sets of five repetitions, the 'Case' began forging the force of a thousand angry pistons into his pectorals, triceps and deltoids. He was, to say the least, an oddity amongst the super supiners! Even though he swears to a big grand-daddy and stocky womanhood on his ma's side, his prowess can not be attributed to genetic superiority, as Pat is a small boned man. "I was average in every regard and didn't seem to have any special strength, at least nothing I was aware of," says Pat. What he did have, though, was that great mom who taught him all about hard work and purposeful labor. Hard work is what Casey believed in. "To this day, he says, "I still don't think I've ever met anyone who trained as hard as I did!" Take the summer between his senior years in high school, for instance. During that short four month time Pat gained 50 lbs in bodyweight. He did nothing but eat, sleep drink milk and train. One man in Redpath's Gym who gave Pat friendly guidance was Gene Mozee, a bencher of considerable repute himself. Mozee taught Pat to condition his body with bodybuilding as well as to bench mammoth tonnages. Mozee knew whereof he spoke, benching 425 officially at a bodyweight of 180. Even with the juice flowing around these days that's one bodaciously bad lift! Now, lest you think these 50 lbs weren't the tiger-type stuff, Pat had bench pressed 430 already, and he was still a senior in high school, weighing 230 lbs. Remembering his bodybuilding background (and some small contest success), Pat decided to try for the Mr. Teenage America title in 1957. Knowing little of losing weight (this is a guy who thought only of getting bigger) Pat just cut his milk a bit, and that's about as cut as he got . . . a bit! The biggest teen in the contest, Pat settled into fifth place behind Mike Ferraro. And that was the end of bodybuilding. By this time Casey's five sets of five had become more like ten sets of five as he continued to train like a man possessed. At the same time, he intensified his training, left the familiarity of high school, and ventured into the real world. The first upright thing to do was take a job. As his mom used to say to him, "Got to get a job, Pat. It'll keep you out of trouble." So he did, and it did. Actually, Pat was less concerned about staying out of trouble than figuring out a plausible way to afford a dairy cow, because that's what he really needed. Milk was still the 'in' thing in those days. Pat labored as a shipping clerk and even fell in love (not with the bench, this time with a real live girl). Soon, he set himself to the task of becoming the strongest entrepreneur in all of L.A. He bought a juice bar at what had by now become Bill Pearl's Gym. He worked himself into being a distributor of a delectable variety of weight gain protein powder, known as MUSCLE-ON. The old story of eating up all the profits proved true, as Pat disbursed most of the nitrogenous stuff to his bulbous pectorals. A year later he had taken to managing a gym in Bellflower, California (yes, the same home of that other famous California Irishman, Jerry Quarry). He was thinking of opening a second gym in Norwalk as visions of Jack LaLanne danced in his head. After another year had passed, he decided to give away the MUSCLE-ON rights (a move he later regretted), and moved to Norwalk, setting himself up in training and business there. Pat was now 25, and all this time his bench press had been cascading forward. Before he turned 20, he benched 500 (the first teen to do so legally). That took place in 1959 when he weighed all of 238 pounds. This still remains an almost impossible feat, especially for a man 73 inches tall and clean as Mr. Clean himself. Since Pat's chest was his own bomb shelter, he survived the Cuban missile crisis of October, 1962 with nary a concern. He and good friend Steve Marjanian didn't have time to worry about some Russians in Cuba. They left that for the Kennedys. By 1964, in a training session with Marjanian, Pat had benched 600 lbs at a new bodyweight of 287. Marjanian traveled 60 miles each day just to spot Pat in the bench. True friendship! Pat still owned Norwalk Gym, but was about to let go and join the Police force in Seal Beach, California. Besides, he now did the better part of his training at Bill West's Westside Barbell Club, with guys like West, George Frenn, Len Ingro and other early odd lift greats. Even though Pat got the 600 by 1964, it took him nearly two more years to do the bugger officially. Shortly after getting it in the gym, he suffered an excruciatingly painful injury to one of his pectoral muscles, a pain he still feels today. He was doing parallel dips with added weight. In this case he had he had 375 lbs strapped around his hips, which with the addition of his 300 lb bodyweight meant he was lifting nearly 700 lbs (the Eder influence, you see). Succumbing to some friendly gym taunts (why anyone would want to taunt Casey is beyond me) to go lower in his dips, Pat did. He still remembers the sickening sound of his flesh tearing as he did. The injury set him back two years. Circa 1966, Leo Stern was a big promoter of bodybuilding and strength in the San Diego area. Seeing the phenomenal growth of Powerlifting between the years of 1964-66, Stern decided to get into the act in a big way and promote a contest of the giants. Competition would be on an invitational basis, so it would include only the best and would cut across several weight classes. The bombers flew in for the heavyweight class. 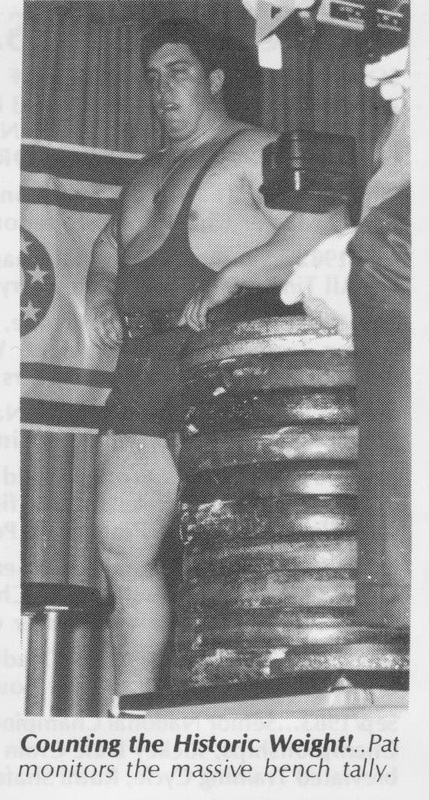 The giant Texas, Terry Todd, had defeated Gene Roberson for the National Powerlifting title. He was undefeated and Stern saw fit to bring him to the West Coast to do battle with Pat. Casey was undefeated too, with the only problem being he had yet to prove himself against anyone, whereas Todd had. Reputations were clearly on the line. The gym rats were at it again, taunting Pat that he would surely meet his match when the Texas Tornado came to town. Pat was training in a frenzy, but suffered a bad back strain only two weeks before the meet. He couldn't back down at this point, so for the last few weeks he rested and sat in hot whirlpool baths instead of training. The animals emerged, full force. George Frenn was on hand to squat 600 lbs with an ankle to knee cast on! Terry put up a 480 lb bench and Pat responded with a record 590 (in those days the bench was done first). Pat was worried about the squat. He had done 725 in the gym before he hurt his back, and he expected Todd to be good for close to 700, if not more. Todd proved true to his buildup and pounded up a big 680. Pat caught fire and blasted out an immense lifts of 775 lbs, another record. With the contest no longer in doubt, Pat pulled a light 600 lb deadlift, deciding to take it easy on his back. Before the contest, he actually had designs on a 700 lb effort, but discretion was the better part of valor in the Sixties too. Meanwhile, Todd figures he would show the upstart a thing or two anyway, and deadlifted and easy 740. He then made a quick calculation that showed he was only 65 lbs behind Pat. Realizing he couldn't get the 800-plus he needed with his short-fingered grip problems, he opted to try the load with straps, to let the crowd no the power was there. Terry pulled the big 804 to his knees, but could not straighten out with the load. Casey had won! Pat, the gentleman he is, promised Todd a rematch at a later National Championship, but it never came off. Pat still regrets that he didn't give Todd another shot at him. Casey moved on. In a later meet in 1966 he lifted 580 lbs in the bench, but made an 805 squat and a 640 deadlift, with a close miss at 675, even though his sciatic nerve always bothered him (Pat never did get in much deadlift training and besides, good benchers are seldom great in the deadlift). When he did this, Pat was the first to officially bench 600 lbs and total 2000! His total of 2035 was considered the world record. Still, he wasn't finished. With his bodyweight approaching 330 lbs, Pat nailed down a 615 bench press in June of 1967. In training, Pat did a touch-and-go in extremely strict style with 635. Later, he competed in the L.A. Powerlifting Championships. He was too conservative with his bench attempts, finishing with a ridiculously easy 620. He later figured he was so strong that day that he could have done a double with the weight. Pat asked for a fourth attempt, but in those days such things were unheard of. Pat had always been concerned with his health and by now his blood pressure was higher than Wilt Chamberlain's head. The day after his 620 bench, Pat started his diet. After all, Todd was easing out of the limelight, Gene Roberson had decided to use his PhD to make some money, and Pat wanted to be able to see his own feet again. Furthermore, although Bob Weaver was hefting some big totals, no one was around in Casey's Bench league (although Stan Holland was claiming 580 in the gym). Pat began to see something else, steroids, and he didn't like what he saw. So, the big man did what any logical man would do. The day after his bench he went to the local track by himself. He started running, but barely finished a quarter mile. One year later to the day, some 100 lbs lighter and with a waistline 15 inches slimmer, Pat ran a mile in 6 minutes, 17 seconds. His blood pressure was normal. Pat Casey would never bench heavy again.